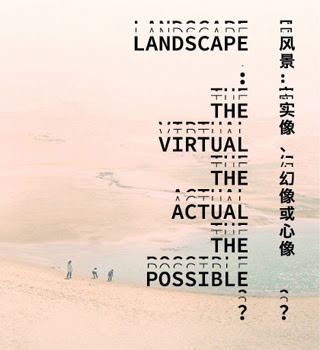 Landscape: the virtual, the actual, the possible? considers visual, perceptual, and conceptual systems that have become increasingly unstable, both physically and metaphorically. It invites creative perspectives to connect two distinct geographic and cultural contexts, California in the United States and the Pearl River Delta region in China: from the cybernetic utopia and technology frontier to the world factory of electronic products; from the natural romanticism and ecology movements to massive urbanization and land struggles. The featured artworks touch upon subjects such as nature, landscape, the urban garden, virtual reality, digital technology systems, and their junctures. The title refers to Félix Guattari’s “four ontological functors”: the virtual, the actual, the real, and the possible. Through the lens of landscape, the exhibition poses the following questions: What is the mirror effect between landscape and technology, and how does each inform how we understand and experience ourselves and the other? How do different perspectives and approaches affect our mental images of landscapes? The Anthropocene discourse and its extended cultural and social debates serve as the larger background. The thesis proposes that we are entering a new geological epoch and claims that since the Industrial Revolution, human activities have altered the environment so extensively that a new form of nature has been created. The thesis also recontextualizes and reframes traditional debates regarding the relationship among humankind, nature, and technology. Some visual elements and patterns have become too ambiguous to be recognized and interpreted based on one perceptual state, meaning that humans are no longer the foreground of existence. Instead, the distinctions between background and foreground, human and non-human, culture and nature, subject and object, the planet and history have become transferable, variable. This multi-stable relationship challenges the formerly stable and dualistic perspectives of modernity. While the universalist dimension addresses the largest possible frame (the entire world), it is also true that our individual realities are today increasingly fractured and multiplied by the frame of the computer and smartphone screen. What are the relationships between these micro-frames and the larger world? What lies outside of the frames? Whereas actual landscapes rely on perspectives, views, and vistas, the screen compresses and flattens space. According to Anne Friedberg in her 2006 book, The Virtual Window: From Alberti to Microsoft, the screen fosters “static, moving, multiply layered, obliquely angled, abstract, sequential, or multiple-frame images.” What integral qualities of the material world are preserved when it is translated into visual art, as artists track our experience of the stuff of nature? The exhibition proposes possible links between this seemingly new, technologically mediated perspective versus ways of looking at the world that are rooted in traditional Chinese philosophy. In the latter, the works of humanity, far from imposing order on the landscape, seem designed expressly to conform to its natural contours. This corresponds with a cultural value system that views humanity and nature as sharing a common structure, their order and forms resonating and flowing in dynamic balance. Works by Lucas Blalock, Elina Brotherus, Marcelo Cidade, Tacita Dean, Charles Gaines, Vidya Gastaldon, Paul Kos, Liang Shuo, Anthony McCall, Alicia McCarthy, Charlotte Moth, Simon Pyle, Hiraki Sawa, Maaike Schoorel, Lois Weinberger, Robert Zhao Renhui, Zhou Tao, Toby Ziegler; new commissions by Chen Xiaoyun, Tsang Kin-Wah, and Zheng Guogu. The exhibition features many works from the Kadist Art Foundation, and was organized by the Kadist Art Foundation, the Guangdong Times Museum and Yerba Buena Center for the Arts. Co-curators: Betti-Sue Hertz, Yerba Buena Center for the Arts (San Francisco); Ruijun Shen, Guangdong Times Museum (Guangzhou); and Xiaoyu Weng, Kadist Art Foundation (Paris / San Francisco).